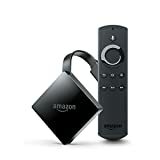 The Fire TV with 4K Ultra HD and Alexa Voice Remote is just as powerful and capable as a full set-top box, but it tucks away behind your TV because all that oomph is crammed into tiny little device with a dongle form factor. If you haven’t experienced how great Amazon’s fire Fire TV device with 4K and HDR is, now is your chance. For one day only, Amazon has slashed the Fire TV back down to the lowest price it’s ever been. Grab one now and you’ll save $15!